Editor's Note: Catch the latest addition to Kitco.com! Seasoned Metals Analyst, Kira McCaffrey Brecht will be sharing her extensive commodities knowledge on Kitco.com. Kira has been writing about the financial markets for over a decade -- posts during her career include Managing Editor at TraderPlanet, Chicago Bureau Chief at Futures World News, Market Analyst at Bridge News and Technical Analyst for MMS International and Managing Editor at SFO Magazine. A spate of better-than-expected U.S. housing news combined with bullish surprises from Chinese economic data have underpinned the copper market, an industrial metal widely used in building and construction. A look at a weekly chart for silver and copper futures reveals a fairly tight correlation between the two metals. Fundamentals and technicals favor continuing advances for copper, and the long-term correlation between the two metals suggest silver may have more room to run on the upside as well. In the news this week, U.S. housing starts surged 12.1% in December, hitting a 954,000 annual pace, according to Commerce Department reports. That marked the highest level since July 2008. Looking ahead, on Tuesday, December U.S. existing home sales are due for release and consensus estimates point to a 5.13 million pace, following November's 5.04 million rate. The U.S. housing market collapse was at the center of the 2008 financial crisis and many analysts now believe that the housing market has turned the corner. Most recoveries are led by the housing sector, because it is an interest-rate sensitive area of the economy. The latest recovery in the U.S. was by no means "normal," but the positive housing data bodes bullishly for the economy overall. Copper will be a direct beneficiary of continued strength in the housing sector. China is the world's largest consumer of copper and the U.S. is number two. About 50% of copper demand is utilized in building and construction. Also this week, fourth quarter GDP data out of China surprised on the upside with a 7.9% year-over-year pace. Most economists believe the low point of the Chinese economic slowdown is now in the rear view mirror with better growth ahead for 2013. This all bodes bullishly for metals with industrial uses—both copper and silver. A weekly chart overlay is shown below, with the weekly nearby Comex copper contract in red and the weekly nearby Comex silver prices in black. Directional trend has been comparable over the last several years. Silver has an advantage over gold in that is both a precious and industrial metal. Looking at the daily Comex March silver futures chart, the contract has marked out a bottom at the Jan. 4 spike low at $29.24. The bulls are trying to claw their way back toward important resistances levels from the November and December swing highs at $33.87 and $34.49. A rally through $33.87 would be confirmation that the December peak at $34.49 and even the October peak at $35.51 is back in play. 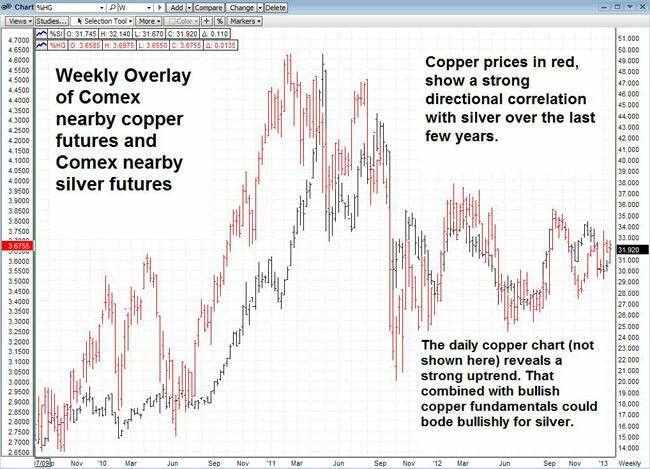 On the daily Comex March copper chart, the near and intermediate term technical trends are bullish. The next major target and objective for the bulls lies at $3.759 a pound, the Jan. 2 peak. Beyond that ceiling, the bulls will be bucking for a retest of the September peak at $3.848. The technical trend is bullish for copper and fundamentals are constructive. Silver bulls are battling back, but still have more work to do on the upside. But, the supportive backdrop for copper should keep help keep the silver contract underpinned as well.